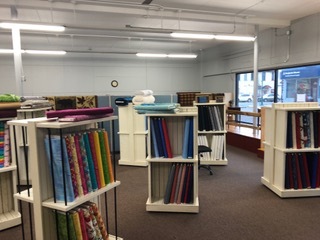 SPOONER, Wis. -- Marilyn Hull, the owner of the new quilt shop at 237 Walnut in Spooner, will soon be opening the doors of her shop with all things to excite sewers everywhere. Their longarm quilter will be up and running and not only will she carry quilting cotton for sale, but denim, fleece, and flannel. Cottage Treasures is where you can buy the one hundred and eight-inch 'wide backs' to make a one-piece quilt back for your creation, but also ninety-three inches wide batting by the yard. According to the statistics Marilyn has from Quilting in America, 10.3 percent of Americans participate in quilting. That's sixteen million people with a median age of sixty-four that do quilting and fiber crafts like knitting, felting, and weaving. It was in that spirit that Marilyn has visited fifty-five quilt shops over the past eight months to check out what people are doing and what they are offering their clientele. Not only will there be sewing and quilting classes for each level of learning, but she will be carrying Juki sewing machines for sale with service added. The Juki ranks as the number one sewing machine manufacturer in the world and is headquartered in Japan. Juki markets their products to one hundred and fifty countries on six continents, including Spooner, Wisconsin. You will also be able to find a complete notions area along with bolts and bolts of exciting new fabric prints and colors. Cottage Treasures Quilt Shop will be open Monday through Wednesday from 10a to 4p. Closed Thursdays, and then open on Friday from 10a to 4p and Saturday 10a to 3p. Closed Sunday. Their website is cottagetreasures4you.com and if you need more information, contact Marilyn by email at cottagetreasures4you@gmail.com or by phone, 715-635-0998.